The GK70 is fairly solid; build quality is good throughout. The plastic underside is topped with a gunmetal grey, brushed aluminium faceplate, and MSI has sought to spruce things up further by inserting its dragon logo into the space above the arrow keys and including a chrome-effect plastic strip between the two top rows. There is minimal excess bulk; the GK70 is about as small as it could be. On both sides there are glossy plastic bits which also have integrated RGB lighting. Flipping the board over, we find integrated cable channels designed to house the nicely braided and weighty micro-USB cable that’s also detachable. There’s also a pair of flip-out feet that are very robust, and lots of rubber to keep the board planted. MSI uses the popular Cherry MX Red RGB switches here, featuring 4mm of total travel and a 2mm actuation point at a light force equivalent to 45g. The action is linear with no tactile bump or audible click. There aren’t any other choices available, but the GK70 has the option of Cherry MX Speed Silver RGB switches instead. Either way, I find the Red switch to be a great all-rounder suitable and comfortable for both typing and gaming, and the same proved true with this keyboard. The keycaps atop the switches are all standard size. MSI ships the board with metal contoured WASD keycaps substituting for regular plastic ones, but normal ones are thankfully supplied; typing feels very weird when a few of the keys have a different feel and angle to the other keys. There’s also a keycap remover to allow for easy swapping, as well as a set of blank, textured keycaps that can be used in place of others to allow for easy identification without looking. The set includes a spacebar, a left shift key that is redundant on the UK layout, eight regular-sized keycaps, and two slightly larger ones that match the size of keys like Ctrl and Alt. Note that none of the extra keycaps allow light through since they are left blank. One accessory missing from the suite is a palm rest. This isn’t a deal-breaker, but it is found on other boards at or around this price, so it’s worth mentioning. Like many keyboards, an FN button gives many of the standard keys additional functions. Volume and media controls are found in the top-right, for example, while F5-F8 can increase or decrease the repeat rate. 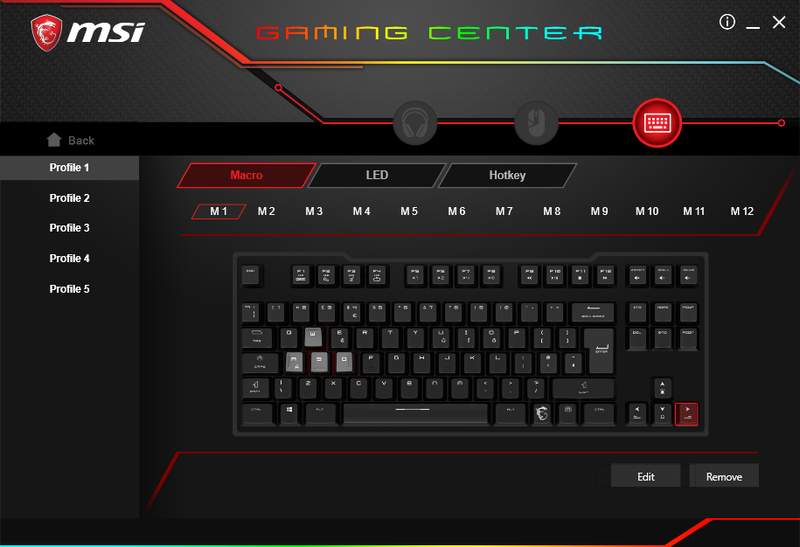 MSI also incorporates controls for toggling certain overclock modes on its motherboard and VGA products in the six keys above the arrow ones. Lighting customisation can be handled entirely through the hardware if you wish, but software is needed for macro storage and can also supplement the lighting controls. The five onboard profiles are accessed with FN and keys 1 through 5; FN and 0, meanwhile, triggers the default profile that cannot be customised. Within each profile, you can trigger a gaming mode, which disables the Windows key and enables full-key rollover. The hardware controls for lighting are among the most extensive we’ve seen. You have 14 modes to pick from, including static patterns specifically designed to reflect the default key arrangements of League of Legends, CS:GO, and Overwatch. Static patterns permit brightness control through 11 levels including off, while dynamic patterns have three speed settings. Single-colour patterns, meanwhile, have a few different options for the actual colour you use. One of the modes is a fully custom one, although the lighting is only static. With FN and F1, you enter palette mode, whereby the 12 F-keys are illuminated in different colours, each of which is fully customisable through all RGB values. Select one of these 12 keys, and the R, G, and B keys light up, and you can then select a colour channel to increase or decrease with the arrow keys. This palette can then be used to “paint” the custom profile on a per-key basis. Honestly, it’s even more convoluted than that sounds, and while part of us applauds the fact that you can actually change each channel between all 256 values, a bigger part of us thinks this is just unnecessary, since the changes between each value are so small that they’re visually indistinguishable, and you end up having to mash the arrow keys repeatedly to start seeing an impact, so perhaps having eight or 16 steps per channel would have been a better idea. While custom macros are supported, there are no on-the-fly options for recording them, which is a shame. It’s a feature found on other keyboards, and recording on-the-fly allows you to easily record in the middle of a game i.e. how and when you would actually press the buttons. Instead, you’ll need to install the Gaming Centre software, which auto-updates your keyboard’s firmware if there’s a new one available. The software is very basic compared to offerings from key competitors in this space like Corsair, Razer, Logitech, SteelSeries, and Roccat. The lighting section merely reflects what can also be done with the hardware, although we noticed that changes done on the keyboard itself do not automatically update the software, which can lead to some confusion. The software is definitely more streamlined when it comes to specifying exact RGB values, and it gives you extra colour control for the preset patterns too. 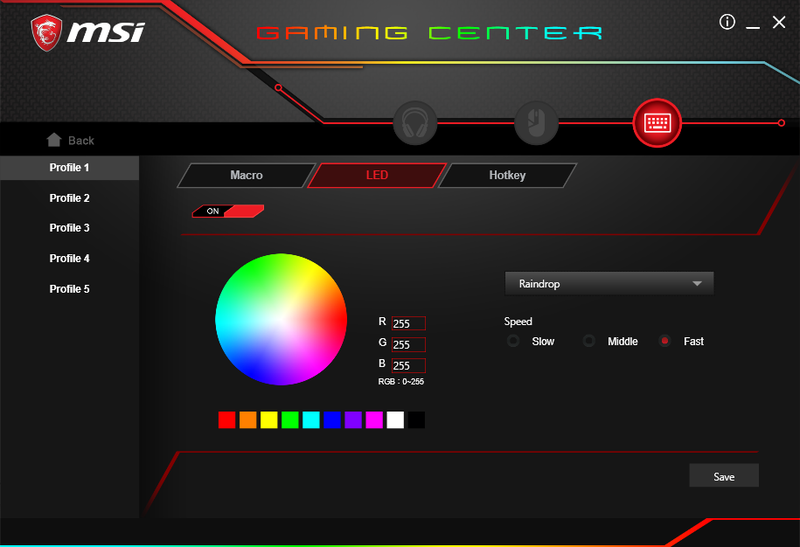 You can also download the Mystic Light app separately if you have other MSI hardware that you would like to synchronise the lighting with. The macro part of the software, meanwhile, was even worse for us. After a few attempts to record one, it broke and prevented recording entirely. Updating the firmware at a later date fixed this, but any macros I recorded failed to save correctly to the profiles. The actual recorder also has issues, failing to detect a second key press while the first was held down, which is actually a pretty major flaw. It is hard to know if these issues are sample-specific, of course. Even if they are, though, the key customisation options are pretty limited compared to those on competing products. That’s largely a part of MSI sticking to hardware-based functions only, but even as a complementary software suite it lacks shine compared to one from Cooler Master, for example. Software issues aside, the GK70 is a promising product. After all, there are very few issues with the hardware itself, as it’s well built, fully mechanical, easy to transport, and easily customisable via a series of simple and not-so-simple shortcuts. However, compared to the competition, it’s sorely lacking on the software front. I respect the hardware-focussed approach, but it’s still something that companies like Ducky and Cooler Master do better; if you want to stick to onboard profiles and not have any software installed, those are the companies I’d recommend ahead of MSI right now. Meanwhile, if you’re fine with having software to boost the potential of your keyboard, you’re again spoilt for choice. 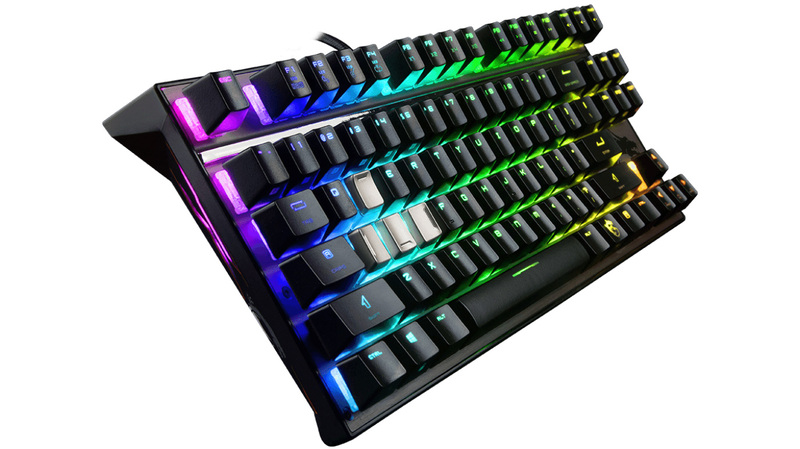 The GK70 is also very expensive at £130; Corsair’s excellent K65 RGB models, for example, retail for around £115. In short, the GK70 has lots of potential, but it’s let down by subpar software and an inflated price tag, which makes it tough to recommend in a highly competitive market.